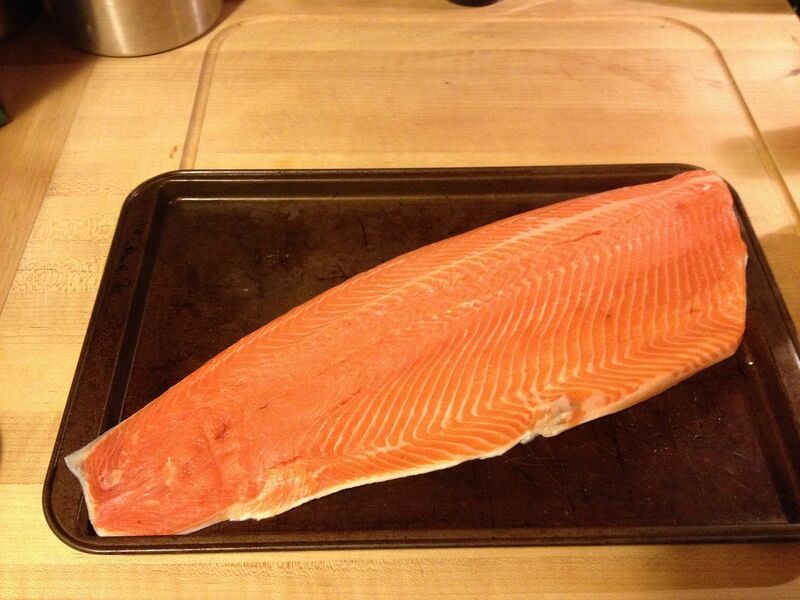 After falling to the Sirens call at Costco, this time from the evil end case in the meat department, I found myself in possession of a nice piece of Steelhead for dinner. 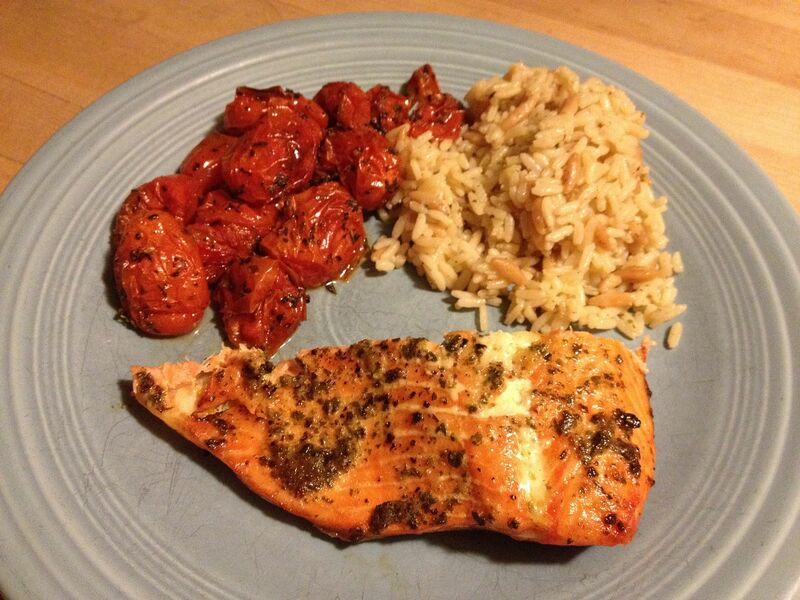 I was looking to prepare a dish that was different than the usual rubbed and grilled piece of fish. After searching the refrigerator, some leftover pesto was just begging to be used. 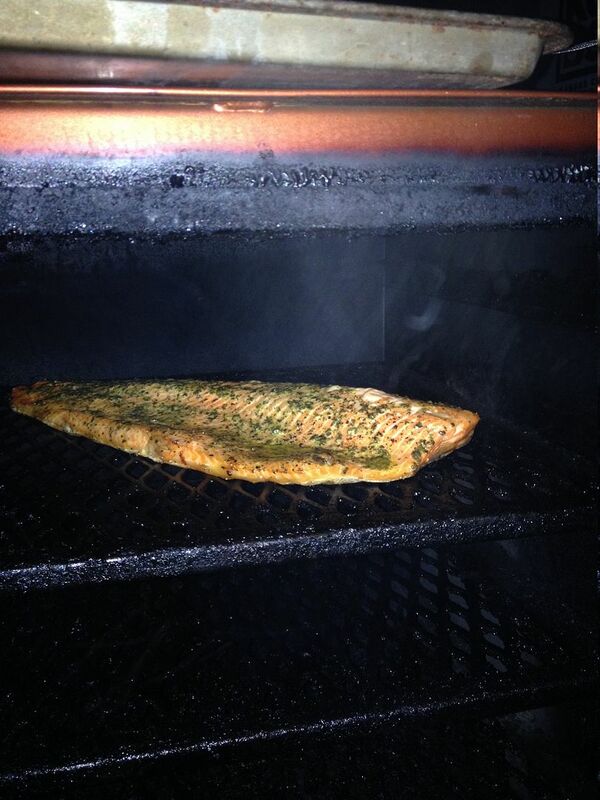 So, I fired up the smoker and headed to the kitchen. The pesto we use is a pre-prepared offering that we find in our dairy case. This product is pretty good for the price. 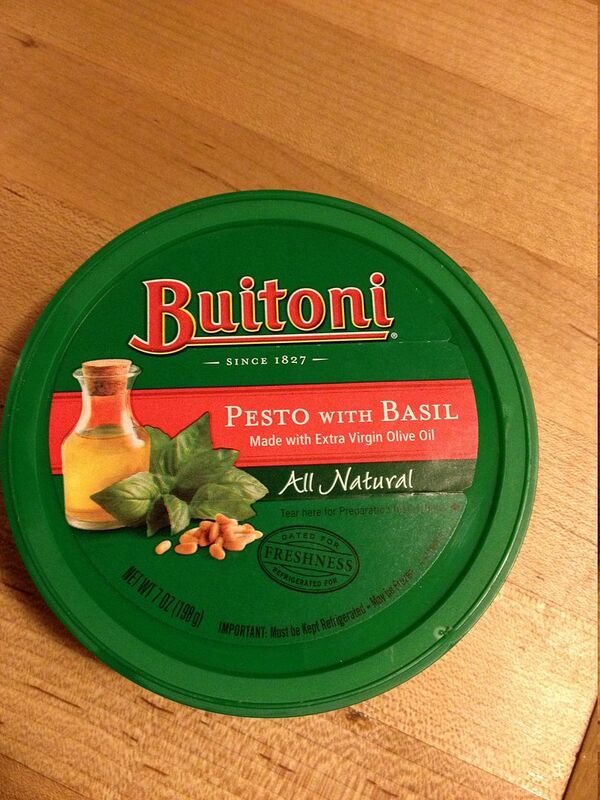 It has a nice balance of basil, pine nut, and Parmesan cheese and works well in both pasta and pizza dishes. My reasoning was simple for this recipe. 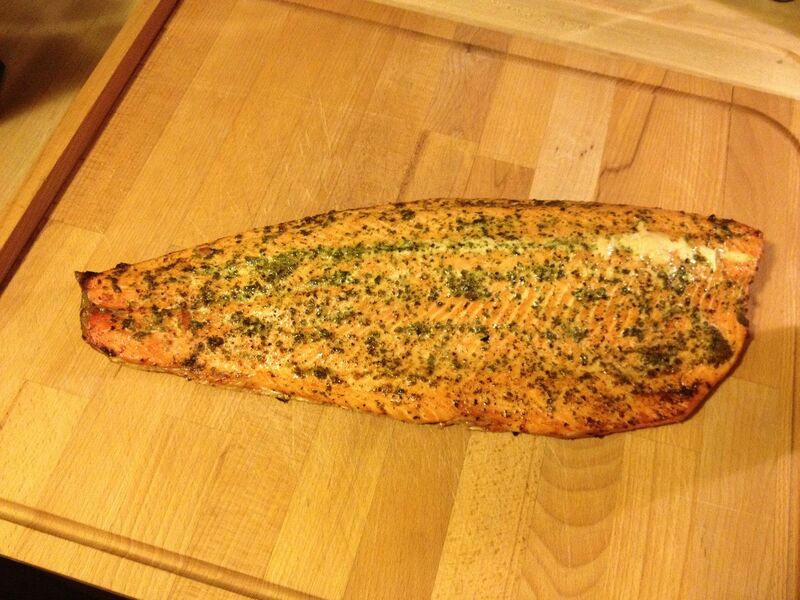 Wash and dry the Steelhead fillet, coat with the pesto, bring room temperature, then smoke roast at 350 F until the meat was done and the skin was crispy. Once I applied the pesto, I added a very light seasoning of sea salt and fresh ground pepper. Once my smoker was at 350 F, I added a piece of alder to the ash pan for smoke flavor and them placed the fillet on the top rack with the thick side positioned on the hot side of the smoker chamber. About 25 minutes later, the fillet was done. 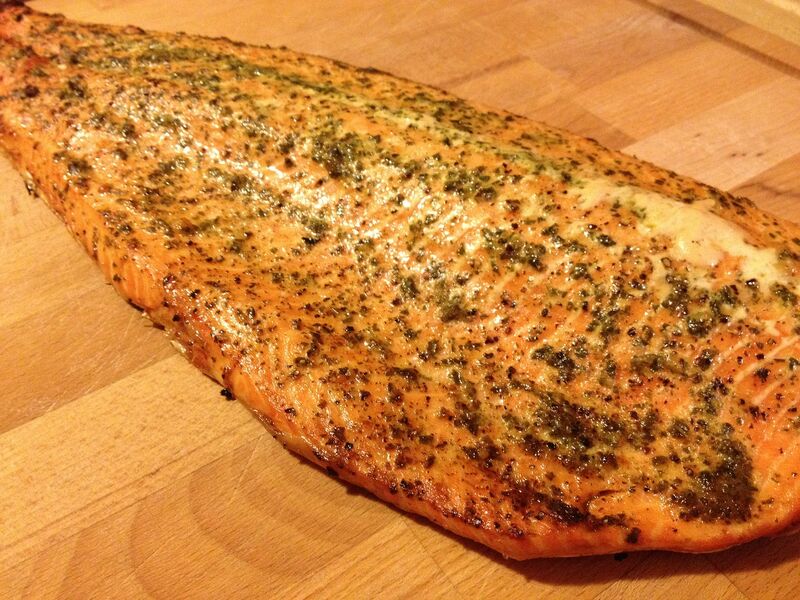 One tell tale sign of your Steelhead being cooked is when the white fat is starting to render from the fillet and the meat starts to become flaky. Overall, the fillet turned out well. 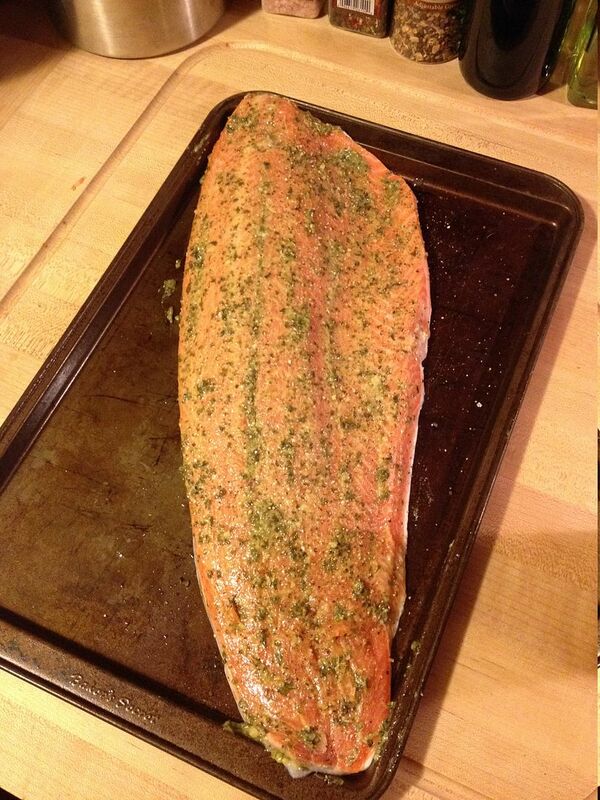 Alder always pairs well with fish, especially with a fatty fish such as Steelhead. I would have liked for more of a pesto flavor. The pesto taste was their, but not as strong as I would have liked. Since pesto has an olive oil base, I suspect that during the cooking process the majority of the basil and pine nut flavors were carried away in the olive oil dripped from the fillet during cooking. I will be trying this again, but I think I will add the pesto at the end of the cooking process, either in the smoker or on the grill. This was a good start to further develop this recipe. That is a great idea. How about using the pesto as you did and just adding a little at the end. When we use pesto with pasta it is added only at the end and gently warmed. Using it at the beginning probably helped because of the olive oil. Good times. I like how you think Chilebrown. Consider it done the next time around!